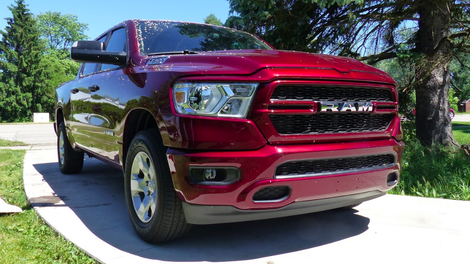 The 2019 Ram 1500 Tradesman is supposed to be “the cheap one,” but once you start spec’ing items like the big engine and towing packages that unlock the truck’s maximum capability, the price creeps up quickly. Meanwhile, the interior’s still pretty spartan. Here’s what that all-business configuration is like to drive. Back in June, I conducted an off-road comparison between the Mahindra Roxor and my 1948 Willys CJ-2A Jeep. But since the Michigan off-road course was 150 miles from my house, and neither vehicle was capable of driving more than 45 mph, I had to figure out a way to get the two billygoats out into the mud. Luckily, my friend volunteered his old Ford F-250 to yank the Willys on a U-Haul trailer. But the 3,000 pound Roxor—which Mahindra supplied in a large ~2,500 pound enclosed trailer—needed to be transported by something a bit less... sketchy. The solution: a 2019 Ram 1500 Tradesman quad cab with a 5.7-liter V8 and a trailer tow package. The Ram pickup is one of Fiat Chrysler’s biggest cash cows (and the company’s best seller by far), so it was a huge deal when FCA redesigned the truck for 2019. The all-new model, referred to internally as the “DT,” not only did away with the classic crosshair grille that was once Ram’s trademark, but it got a lighter frame; mild-hybrid powertrains; a more aerodynamic body; enablers like Active Tuned Mass Modules to reduce noise, vibration and harshness; and a new interior with an optional gigantic 12-inch touchscreen. That latter one—along with the hybrid powertrain—was really what distinguished the new Ram from the old one, which is why we highlighted the two changes in our headline when the truck debuted. My test truck had neither feature. The 2019 Ram DT promises be more refined than its predecessor, offering an interior filled with more tech and a prettier and slipperier exterior. But mine just felt like a work truck. And that’s not necessarily a bad thing, until you look at the price tag. The Ram 1500 Tradesman comes standard with cloth seats, a tiny five-inch infotainment screen, and 18-inch steel wheels wrapped in all-season tires. My vehicle, the Ram 1500 Tradesman Sport Crew Cab 4x4 (4x4 adds a whopping $3,500), had the $795 Sport Appearance Package, so the steelies became alloys, the grille and bumpers became body-colored, the fascia got fog lamps, and the interior got some special trim. This truck also got optional bed-liner ($450), a rear power-sliding window ($1,555 with SiriusXM satellite radio), an electronic locking rear axle ($495), a 33-gallon fuel tank ($425) and a 5.7-liter HEMI V8 ($1,195 with the stronger 8HP75 instead of the 850RE eight-speed automatic transmission). That V8—a version of which has been in Chrysler’s lineup since basically the beginning of time—cranks out a factory-claimed 395 horsepower and 410 lb-ft of torque, and is tasked with propelling over 5,000 pounds of truck in addition to whatever load is in the bed and whatever is hanging off the rear trailer hitch. My test truck was not a mild hybrid, so it had a standard alternator instead of a fancy 48-volt Belt Starter Generator, which would have added another $800 to the price tag. The 1500’s Hemi is bolted to an 8HP75 ZF-based eight-speed automatic with a rotary dial shifter on the dashboard. That trans is hooked up to a two-speed transfer case, which powers a five-link, coil-sprung solid axle in the rear, as well as front halfshafts with CV joints that flex with a double-wishbone independent front suspension. On top of all that, my truck had the Trailer-Tow Group ($545), which included a Class IV trailer hitch, special mirrors, and a trailer brake controller. Add a 3.92 axle ratio ($95), and the Hemi-powered truck was rated to tow up to 11,340 pounds. With all those options tacked onto the Tradesman, the truck’s capabilities came way up off the baseline, but so did the price. Ram says this model starts at around $32,000, the one I drove rang up at $45,195. Since the new Ram 1500 doesn’t come as a single cab, my bare-bones V8 truck was pretty close to being the “enthusiast’s choice” of the DT lineup. It’s got a cloth bench seat, a big V8 under the hood, four-wheel drive, a locking rear differential and not a whole lot else, and that—if you think about it—is all anyone really needs. For my job—towing a 3,000 pound side-by-side in a trailer over 300 miles—that really was all I needed. Between the roughly 2,500 pound Triton enclosed trailer and the Mahindra Roxor, the Ram was yanking about 5,500 pounds up Michigan’s relatively flat Interstate 75, and that task was no trouble at all. The ride was actually reasonably nice, the power was more than enough to merge from on-ramps, and the cab was decently quiet. It was only around 70 degrees outside, and I was only towing half of what the truck is rated to pull up Davis Dam at ~100 degree ambient temperature (these are the conditions of the standard SAE J2807 trailer tow test), so it’s no surprise the Ram did this without breaking a sweat. Or breaking anything else. Yes, compared to the truck being unloaded, the V8 motor had to rev a bit higher before the excellent eight-speed automatic snapped off its clean shifts, and fuel economy was only about 11 mpg according to the display, but otherwise the truck seemed mostly unfazed by the load. I did notice the rear end feel a bit light every now and then, but it’s likely that had more to do with the trailer tongue weight than anything to do with the truck, which otherwise scoffed at my pathetic little trailer. We’ll get into the interior in a bit, but for now, I’ll just say how much I love that automakers to still offer bench seats. The Ram 1500’s is awesome, changing from a three-seater to two highly comfortable cloth buckets by simply folding down the center seat’s backrest, which becomes an armrest with two cupholders and a spacious cubby. The room in the back is also enormous. For passengers, the legroom is plentiful, and there’s tons of room for junk. My friends and I packed the second row with tools, coolers, snacks, tow straps, extra clothes, and there was still lots of space to spare. I also remain a fan of the DT’s looks. The truck I was testing didn’t have the LED projector headlights, and it didn’t have a lot of fancy chrome on the grille or the bumpers, but those “halogen quad headlights” look simple and clean. And with that basic grille with its single horizontal bar, the design just works. So does the rear. Yes, perhaps it’s a bit understated. But this one’s a work truck, so that’s OK. Despite the awesome bench seat, and the interior’s fairly nice design, I’ve got to say I was a bit surprised by just how basic this truck was. I mean, never mind the tiny five-inch display; the materials on the dash and on the doors were—how do you put this nicely—“heavy duty” (i.e. rock-hard). I’m generally not a stickler about hard plastics or small infotainment screens, but this is a $45,195 truck we’re dealing with, and—at least after my short time driving it over a weekend—that seemed a bit steep for such a back-to-basics vehicle (though, to be sure, the price is right in line with the Ram’s competitors, the Ford F-150 and the Chevy Silverado). Ram is offering the old “DS” Ram as the “Ram 1500 Classic,” and I think, especially if it can be had at a discounted price, that might make a more compelling offering for someone looking for a basic work truck that doesn’t cost a whole lot. For anyone who wants a fancier truck, though, apparently the new truck is the one to get, as my coworker—who lauded the big infotainment screen and the panoramic sunroof—can attest. As the DT’s an all-new design, I suppose I was expecting this new truck to be leagues above the DS it replaces. But without the fancy infotainment system, without the hybrid powertrain, and without other interior refinements, the truck—which shares its basic powertrain and suspension design its predecessor—didn’t seem all that different than how I remember the old Ram feeling. That said, the truck was solid. 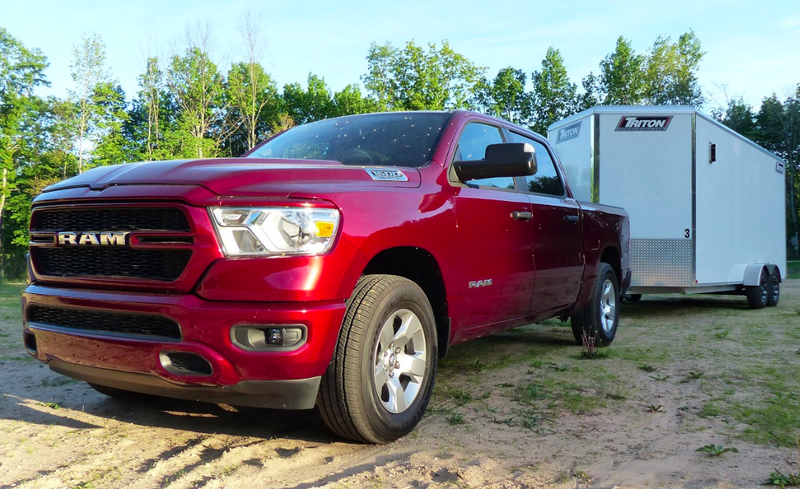 I only drove the 2019 Ram 1500 for a couple of days, and 90 percent of the driving was on the highway towing a big trailer. For that task, the truck handled itself well, despite sucking quite a bit of gas (it’s worth noting, the all-new truck gets the same fuel economy as the outgoing model). The Hemi V8 and the ZF eight-speed worked together like Batman and Robin, interior space was huge, and the ride was great for a pickup truck. Would I drop $45 large for something that’s got an interior made of rock and an infotainment screen the size of a fermion? Probably not. I’d keep an eye out for a discounted Ram 1500 Classic. Because, honestly, aside from styling, it seems like, based on my short test, the changes for the new Ram DT compared to the DS can be hard to discern when comparing “work truck” trims. Too basic unless it's a work truck, but then it seems too expensive. You're hard to stop with a V8 and a locking rear differential.